It’s exam review time, and you’ve got multiple dates, events, people, and places to know. You’ve been an attentive student and hunger to do well in the class, but the collective knowledge seems a bit overwhelming. Well, lots of us have been there; and believe it or not, you can turn such a seemingly stressful study challenge into an enjoyable experience. Here’s how: draw yourself a cartoon as a mnemonic device. This can be amazingly effective, particularly since you use your own ingenuity to create the picture (that in itself is a form of meditation on the material). First, gather your course notes and creative palette (paper and colored pencils are great, though cutting up old magazines could suit your purpose; or for digital panache, you could use a tool like Glogster). Now begin your studying project: use copious amounts of color, dialogue bubbles, and humor. Need to remember something about a historic figure? Sketch him or her clutching a symbol of whatever you need to know. Need to remember an important date? Draw it and drape a symbol over it, under it, or around it. 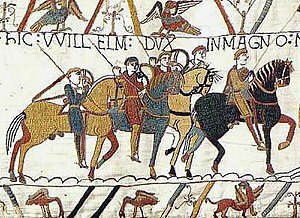 For example: start with a large “1066” and to indicate the Norman Conquest, sketch in some victorious soldiers and name one Norman. To indicate the linguistic significance, you could draw something that reminds you of France or use dialogue bubbles if you know French. The trick, of course, is to focus your creativity squarely on the lessons you’re trying to cement in your brain. Don’t get so wrapped up in the art that you forget the matter. Also, in order for this to be an effective method, the cartoon should serve to jog your memory about something you already have studied. That is, the cartoon-drawing shouldn’t be the only time you’ve touched the material! In the end, if the above example doesn’t remind you that 1066 was the date of the Norman Conquest, significant because it heralded the infusion of the French language into English, then the cartoon isn’t helping you. This project works especially well for History, Humanities subjects, Politics, Geography – and anywhere people and symbols are relatively easy to envision in space. Barry Manilow may write the songs that make the whole world sing, but have you tried writing the songs that make your own brain remember? Song, rhythm, and rhyme are mnemonic devices dating back to antiquity, so why not use the wisdom of the ages to enhance your own studies? Here’s how: next time you’re studying for an exam, set your studies to a song you know. Of course, you could search google to find a mnemonic song someone else has created, but I strongly suggest creating your own. It’s fun, and creating lyrics forces you to boil your studies down to the essentials. True, your songs may turn out weird, but weird could even be best, as it might be harder to forget. I am not kidding. Off the top of my head, I still remember a “functions of the stomach” song my Anatomy & Physiology lab partner and I wrote (to the tune of a ‘60’s folk song) . . . alas . . . and we thought of it around 20 years ago.